Are you searching for a premium magazine WordPress theme? Then you are welcome to take a look at this fine collection of high-quality magazine WordPress themes. These top themes are ideal for modern online magazines or dynamic news websites and also for magazine-style personal or business blogs. Magazine WordPress themes should be able to manage lots of content. MH Newsdesk is a dynamic news & magazine WordPress theme which is perfectly suitable for professional magazine and news websites. This magazine WordPress template is fully responsive and offers all needed features to create awesome websites. Thanks to integrated ad spots, you are able to place advertising banners in a convenient and simple way. This modern magazine WordPress theme is highly customizable and can be utilized for all kind of cool and fresh online magazines and news websites. 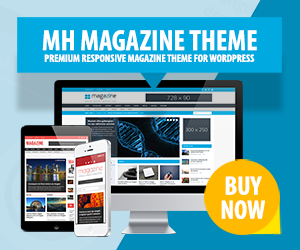 MH Magazine WordPress Theme offers such awesome features as responsiveness, RTL support, flexible layout options and many others. With MH Magazine you can present your articles in a modern and vivid way. Lucid Magazine WordPress Theme is a very user-friendly template for online magazines. It comes with a clean and pure design and puts focus on your great content. Lucid is packed with the most needed features and options to create a modern online magazine. It is fully responsive and looks well-organized on all kind of screen size resolutions. With this feature-rich magazine WordPress theme you are able to create amazing and fine looking magazine websites. Aggregate Magazine WordPress Theme is very flexible and gives you the opportunity to buid a website after your own fancy. It comes with custom widgets, font customizer and many more customization options. DelicateNews Magazine WordPress Theme is ideal for simple and clean websites. This nice template is perfect to manage content in a well-organized way. Thanks to integrated shortcodes you are able to add some extra functionality to your online magazine or news website. DelicateNews is very reader friendly and easy for you to handle and work with. This elegant online magazine WordPress theme offers a great bunch of theme options. With Magnificent Magazine WordPress Theme you may create a modern and very light-weight online magazine or magazine-style blog to share news or personal experiences. Magnificent is a high-quality WordPress theme which manages your content in a simple but yet efficient way. TheSource magazine WordPress Theme is a premium template suitable for online magazines. This WordPress theme is highly modern and very customizable in various different ways. Choose from four unique color schemes and several page templates until you find your best choice. With TheSource you are able to create a unique online magazine according to your needs and wishes. This magazine WordPress theme is very powerful and offers useful customization options as well as many features to tweak your website the way you like. Nexus Magazine WordPress Theme is fully responsive and thus fits perfectly for any kind of screen size resolution. Thanks to its browser compatibility, Nexus is running smooth on the most popular internet browsers.